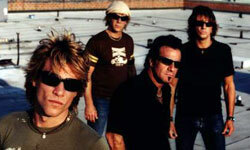 Rockers Bon Jovi continue massive tour, and add new dates to 2008 concert itinerary. Band is giving shows in Canada up to the middle of December, and goes to International leg visiting Japan, Australia and New Zealand in January. US leg kicks off February 18 in Omaha (NE), and stretches to the end of April. Rock band Hedley supports Bon Jovi on Canadian concerts. Daughtry is announces as openner of American shows. Bon Jovi is touring in support of their latest release, Lost Highway, which hit stores in June, and spawned singles "Lost Highway", "Summertime", "(You Want To) Make a Memory", and "Till We Ain't Strangers Anymore".